Eastern Shawnee Tribe of Oklahoma of Oklahoma is one of three (3) federally-recognized Shawnee tribes and are headquartered near Wyandotte, OK. These three tribes were recognized as autonomous nations during the Indian removal era. 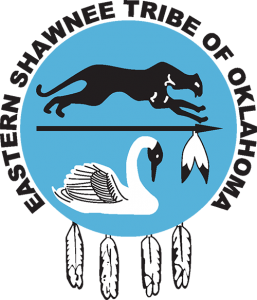 The Eastern Shawnee Tribe of Oklahoma has tribal jurisdiction in Ottawa County, Oklahoma with nearly 3,000 enrolled members. The Shawnees once lived throughout the region east of the Mississippi River. They were a highly mobile, wide-ranging, nomadic people. Their men were known as hunters and warriors. Shawnee men were famous for their ferocity in battle. One of their greatest warriors and leaders was the imfamous Tecumseh. Their women were planters and gatherers. Many important Shawnee ceremonies were tied to the agricultural cycle: the spring bread dance at planting time; the green corn dance when crops ripened; and the autumn bread dance to celebrate harvest. In 1795 most tribes living in Ohio signed the Treaty of Greeneville giving up all of their land except the northwestern corner of Ohio. Tecumseh and many other Indians did not agree with their Tribe doing this. Tecumseh decided that the best way to stop white settlers from advancing onto their lands was to form a confederacy of Indian tribes west of the Appalachian Mountains. He believed that no single tribe owned the right to turn land over to the whites; and if the Indians united together they would have a better chance against the Americans. With the help of his brother, Tenskwatawa (The Prophet), many natives agreed to join the two brothers at Prophetstown, a village they established in 1808. In 1811, after learning about Prophetstown, William H. Harrison, governor of the Indiana Territory, led his army toward the village. While he lost more men in this battle, the Americans held their ground at the end of the day. This defeat weakened Tecumseh’s efforts, but during the War of 1812 he and his remaining followers allied themselves with the British in hopes that if the British won they would return the Indians’ homeland to them. Tecumseh died in one of the most important battles of the war, the Battle of the Thames in 1813. The English-Indian force met an American army led by William H. Harrison where the British soldiers ran from the battlefield leaving Tecumseh and his 600 warriors to continue on their own. Tecumseh’s death signified the end of the united Indian resistance against the Americans. Today the Eastern Shawnee Tribe of Oklahoma is a vibrant culture. Their modern constitution is a multi-branch structure with positions elected by the citizens of the tribe. They also offer many services to benefit and empower their tribal citizens including education, health and social, career and housing. The Eastern Shawnee Tribe of Oklahoma are headquartered near Wyandotte, OK. The Eastern Shawnee Tribe of Oklahoma has tribal jurisdiction in Ottawa County, Oklahoma. The Shawnee language is a Central Algonquian language spoken in parts of central and northeastern Oklahoma by the Shawnee people. Today the Eastern Shawnee Tribe of Oklahoma is a vibrant culture. Their modern constitution is a multi-branch structure with positions elected by the citizens of the tribe. They also offer many services to benefit and empower their tribal citizens including education, career, health and social. The Eastern Shawnee operate their own housing authority as well as the People’s Bank of Seneca, Missouri; the Eastern Shawnee Print Shop; Four Feathers Recycling; Longhouse Management, as well as three casinos, a hotel, a bingo hall, a gas station, a truck stop, and an off-track wagering facility. Their annual economic impact is estimated by the Oklahoma Indian Affairs Commissions to be $164,000,000.